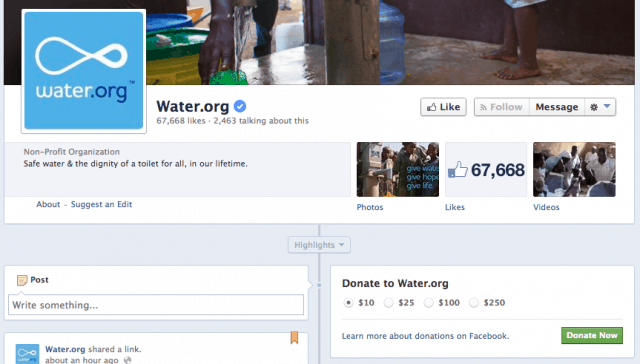 Facebook added ‘Donate Now’ button for non-profits on 17th of December ‘2013. Users will now be able to contribute cash to non-profits directly through this new donation feature. During the initial rollout of the feature, Facebook partnered with 18 different non-profits including the World Wildlife Fund, Livetrong foundation and Boys & Girls Club of America. Users will get to see the ‘Donate Now’ button embedded on the brand page of these non-profits partners of Facebook. The button allows users to donate in preset amounts of $10, $25, $100 or $250, using a credit card, debit card or PayPal. However, if the users come across a non-profit’s post in their News Feed, they can donate through the same button embedded on the post even by entering the preferred amount manually unlike the above mentioned situation wherein they were restricted to some preset amounts. Although, as of now there are only 18 non-profits who have partnered with Facebook, the company “hope[s] to open it up in the coming weeks” to other non-profit partners, according to a spokesperson. Besides, they have no plans adding partners that are not non-profits.